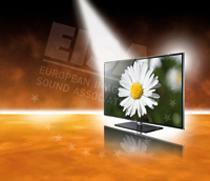 The European association honors Europe's finest products in a range of consumer electronics categories. The European Imaging and Sound Association has announced its 2011 awards for in-car electronics, cameras, mobile devices and most importantly for audio, home theater and video. All of the awards are Europe -centric so there may be a few different models or less familiar brands. The award for plasma TVs went to Panasonic's TX-P50VT30 which shouldn't come as too big a surprise, nor should the Samsung UE40D6500's win for Best Buy. One name you might not have expected to see on the list though - Philips picked up a win in the 3D TV category for its 46PFL9706. Audio awards came out as well, with honorees such as the Pioneer VSX-921 which won for best receiver, the Sunfire SDS-12 which took home an award in the subwoofer category and the LG HX966TZ/TZW won for best home theater system. You can find all the awards and the reasons behind each pick at the EISA page linked below.